The Wraith is becoming one of the most talked about fly rods in the world. The Hardy Wraith AWS (All-Water Reel Seat) comes in two weights, 7 and 8. These are two of the most traditional weights for saltwater and flats species. 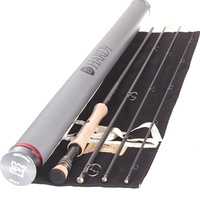 The Wraith AWS from Hardy excels in almost any fishing situation an angler could encounter on the ocean, river or lake. Hardy SINTRIX 550® is a carbon fibre nanotechnology material. SINTRIX 550® is unique to Hardy. No other rod manufacturer is using the same mixture of fibres, 3M resin and specialised manufacturing processes, or achieving the same results. SINTRIX 550® offers significant benefits in strength and weight over traditional carbon fibre. The Hardy Wraith series of fly rods features the formulation of the award-winning Sintrix material - Sintrix 550. The Hardy Wraith AWS exhibits unparalleled recovery and in hand feel for an ultra-fast action rod whilst generating incredible line speed and blank stability for improved accuracy.